When I went to Frome to the vintage textile fair I found an original piece of artwork for fabric. I was so thrilled as it has written in pencil the date etc and I will be framing it and hanging it in my work room for the pure pleasure of looking at its beauty. It is a textile design from 1930 and it is French. The former fern textile mill that it was made in is now unfortunately closed. There is a copy right on the back but I can not read it as its in pencil and a little faded. It is hand painted and the background is blue with a white rose like flower painted on with ribbon like tendrils coming off of the flower. It has been numbered 2953. I am enchanted with my purchase and so happy to have some textile history for my work room, it seems fitting somehow. It is still done like this today. Liberty in London have designers for their fabrics and they still visit the archives for inspiration, can you imagine what wonderful designs are there.... I can only dream about it! 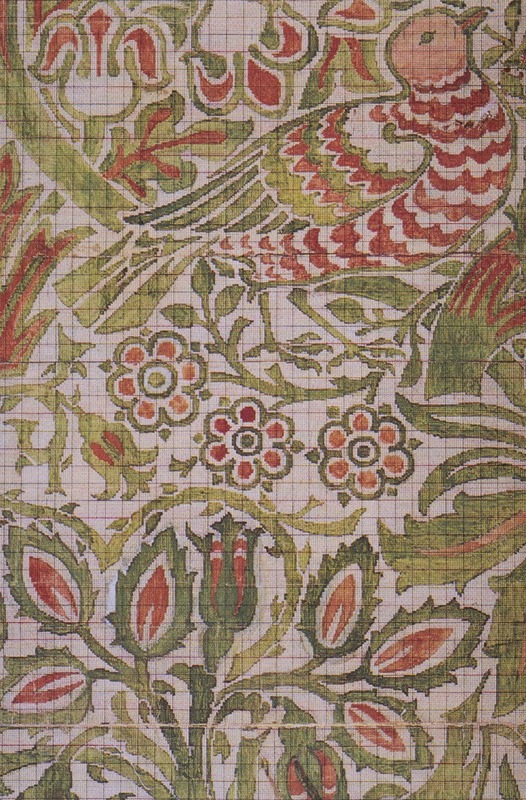 Then my other favourite of his is the dove and the rose and I found this picture on google from its printing patterns for the textile.